Quasicrystals are unusual materials in which the atoms are arranged in regular patterns that nonetheless never repeat themselves. Most are man-made in the lab; only one case of naturally occurring quasicrystals has been found thus far. And now physicists believe they’ve figured out how that happened. In a paper published today in the Proceedings of the National Academy of Sciences, Caltech’s Paul Asimow and his co-authors describe how subjecting certain rare materials to extremely strong shock waves produces quasicrystals. Their results suggest that quasicrystals may form in rocky bodies during collisions in the asteroid belt, before falling to earth as meteorites. What makes quasicrystals so special? Crystals are usually defined by their precisely ordered atoms, forming periodic patterns that repeat over and over again within a lattice (honeycomb) structure. The cells of quasicrystals, however, don’t repeat in an identical pattern. There are small variations in neighbouring cells. And yet they follow clear mathematical rules, akin to the famous Fibonacci sequence, where each number is the sum of the two numbers that precede it (1, 1, 2, 3, 5, 8, 13, 21, and so on). You can see this sort of pattern in the gorgeous medieval mosaics of the Alhambra Palace in Spain, for instance. Think about tiling a bathroom floor, using just tiles in the shape of triangles, squares or hexagons. There can’t be any gaps or overlapping tiles, which means the five-point symmetry of a pentagon, for instance, just won’t work. Except apparently it can, if there’s a way to fill in the gaps with other atomic shapes to get the whole shebang to stick together. Quasicrystals were first spotted in 1982 by Israeli physicist Daniel Schechtman (then at Technion-Israel Institute of Technology), who was studying a sample of an aluminium-manganese alloy under an electron microscope and noticed that telltale odd aperiodic pattern. “Eyn chaya kao (“there can be no such creature”),” he muttered to himself in Hebrew. Yet there it was. 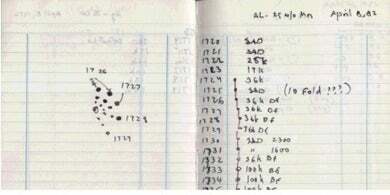 Poor Schechtman endured a lot of mocking from his peers — the head of his laboratory sarcastically advised him to re-read his crystallography textbook — and was even asked to leave his research group at one point, but he got the last laugh. His discovery sparked a revolution in crystallography, and he won the 2011 Nobel Prize in Chemistry. More than 100 different types of quasicrystals have since been made in laboratories around the world. They’re used in non-stick cookware, in LED lights, and surgical instruments, among other applications. But nobody had found a naturally occurring quasicrystal until Princeton physicist Paul Steinhardt stumbled upon one in 2007 while combing through museum rock collections. He tracked it down to a meteorite that landed in the Koryak mountains in Russia, even forming an expedition there to find more quasicrystal samples. 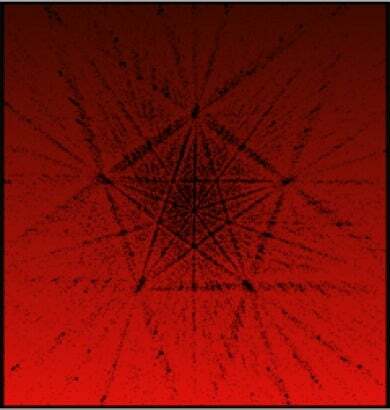 He concluded quasicrystals literally came from outer space. For Asimow, this amazing find raised two key questions. First, how is it even possible for quasicrystals to form in nature? And second, why are they so insanely rare? He got his first clue when Steinhardt mentioned he’d found some strange textures (in the form of iron metallic beads) in the grains from the Khatyrka meteorite. He thought they looked a lot like the kinds of textures that formed in materials during shock compression experiments. Shock compression is when scientists place samples of material in a special steel chamber and fire a projectile at it, subjecting it to incredibly high pressures. It’s a means of exploring how those materials behave in extreme environments. Steinhardt’s hypothesis seemed plausible, since scientists had already determined that the Khatyrka meteorite had undergone some kind of shock event, long before it fell to Earth, most likely from a collision with another object in the asteroid belt the early days of our solar system. So Asimow took a sample of copper-aluminium alloy – similar in composition to the icosahedrite found in the meteorite — put it into the chamber, and shocked it with a tantalum capsule to produce the equivalent of 200,000 atmospheres. And voila! when he and his colleagues analysed the sample afterwards, they observed the telltale pattern of a quasicrystal—now with extra iron in the copper-aluminium alloy. His results provide a basic mechanism, although the precise details of exactly when the quasicrystals formed during shock compression have yet to be discovered. As for why it’s so rare to find quasicrystals in the wild, Asimow suggests it’s partly due to the rarity of that copper-aluminium alloy. It doesn’t show up in any other meteorites studied so far, and these are two metals with very different chemical behaviour that aren’t normally found together. But that doesn’t mean other such meteorites don’t exist. The space rocks used to be quite rare until the 1970s, but now number in the thousands, with more being collected all the time. The best places for hunting meteorites are Antarctica and the Sahara Desert, where the black rocks are easy to spot against the white snow and lighter sand, respectively. Asimow is now fine-tuning his own experiments, partly to determine where the iron traces came from. He has already run two more control experiments to remove potential iron sources in his first experiment, with the most likely being that tantalum capsule. He hasn’t analysed the data yet, but fully expects them to fail to form quasicrystals. And then he’ll run numerous variations on his original experiment, to hone in on the precise conditions under which quasicrystals can naturally form.